DCE/ANS205CR 5-PORT INDUSTRIAL ETHERNET SWITCHTo service the growing need for efficient, reliable data communication in the harsh environments of utility substations and industrial facilities, Data Connect Enterprise has developed a five port switch that can operate from various DC voltages and survive high surge levels and extreme heat and cold. All this without compromising the performance expected from state-of-the-art communications devices.The Data Connect ANS205 has 5 Ethernet Switching ports that support 10/100Base-T, with a 10/100M auto-negotiation feature and auto MDI/MDIX function. 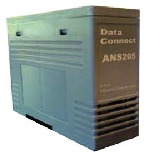 The ANS205 can connect 5 workstations and automatically switches the transmission speed (10Mbps or 100Mbps) for corresponding connections. In the ANS 205 the flow control mechanism is also negotiated.There is link/data rate LEDs for each port in the ANS205 to aid troubleshooting. Port connectors are shielded RJ45. The following are industrial applications: SCADA Telemetry, Vehicle Detail Tracking, Utilities / Metering, Display Signs, Traffic Control. The ANS205 is bundled in a 64mm X 114mm non-metallic enclosure, suitable for desktop or wall mounting. DATA CONNECT ANS205 has 5 Ethernet Switching ports that support 10/100Base-T, with a 10/100M auto-negotiation feature and auto MDI/MDIX function. It can connect 5 workstations and automatically switches the transmission speed (10 Mbps or 100 Mbps) for corresponding connections. The flow control mechanism is also negotiated. There is activity/link/data rate LEDs for each port to aid trouble-shooting. Port connectors are shielded RJ-45. A power source for 10-30VDC is required.